Our online articles are available to view online within your web browser or download as PDF files. The downloaded PDF files require Adobe Reader, a free program from Adobe. 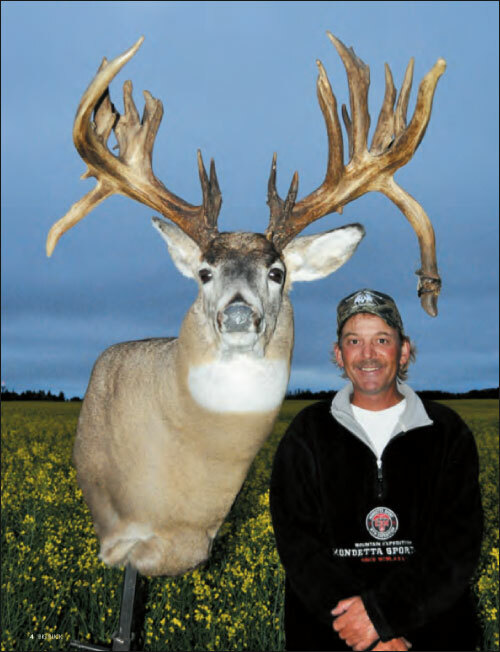 Dallas Heinrichs of Lloydminster, Saskatchewan, with the absolute giant of a whitetail he arrowed on September 3, 2012. The avid hunter couldn't believe the immense size of this buck as he reached its side. The amazing trail camera photo reveals a true monster, but as always, it doesn't show you all the points those big old bucks have on their crowns. In fact, this buck has 29 scorable points in total. Chris Miraglia of North Canton, Ohio, had a hunt of a lifetime that he never could have imagined. When he put up a trail camera in his backyard mere yards from his house and this buck showed up, it was all the bowhunter could think about. 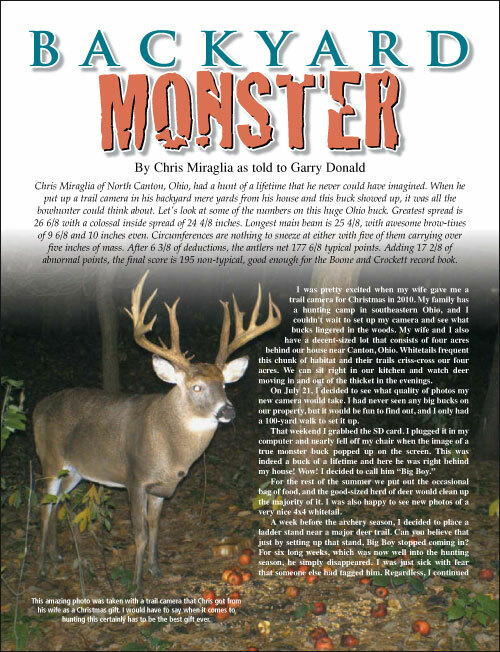 Let's look at some of the numbers on this huge Ohio buck. 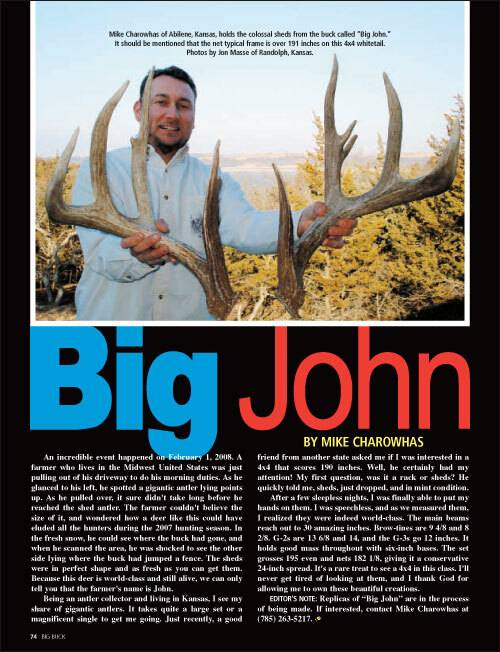 Greatest spread is 26 6/8 with a colossal inside spread of 24 4/8 inches. Longest main beam is 25 4/8, with awesome brow-tines of 9 6/8 and 10 inches even. Circumferences are nothing to sneeze at either with five of them carrying over five inches of mass. After 6 3/8 of deductions, the antlers net 177 6/8 typical points. 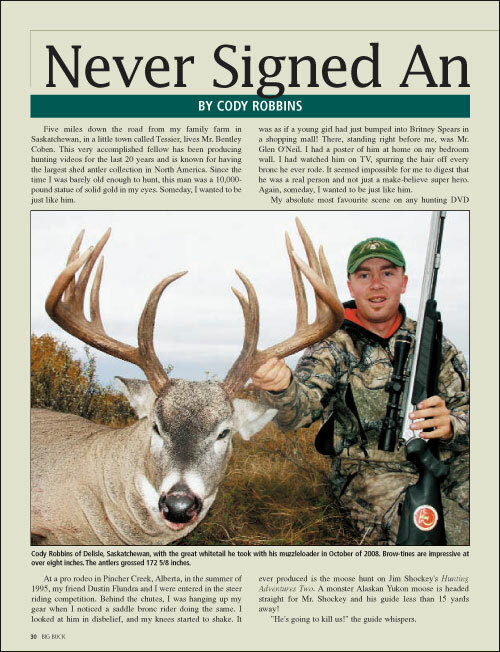 Adding 17 2/8 of abnormal points, the final score is 195 non-typical, good enough for the Boone and Crockett record book. 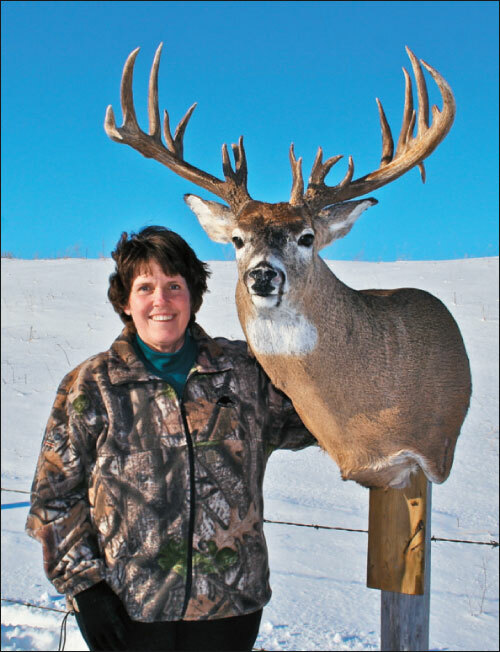 Darcy Brauer of Fort Macleod, Alberta, with the truly gigantic mule deer he took in that province on November 13, 2010. Main beams are 27 1/8 and 25 3/8 with brow-tines of 1 6/8 and 1 4/8 inches. Longest G-2 reaches 14 4/8, G-3 is 10 1/8, and G-4 goes 10 6/8 inches. Circumferences are downright impressive with the largest being 7 7/8 whopping inches. After deductions of 8 5/8 inches, the net typical score ends up at 181 1/8. 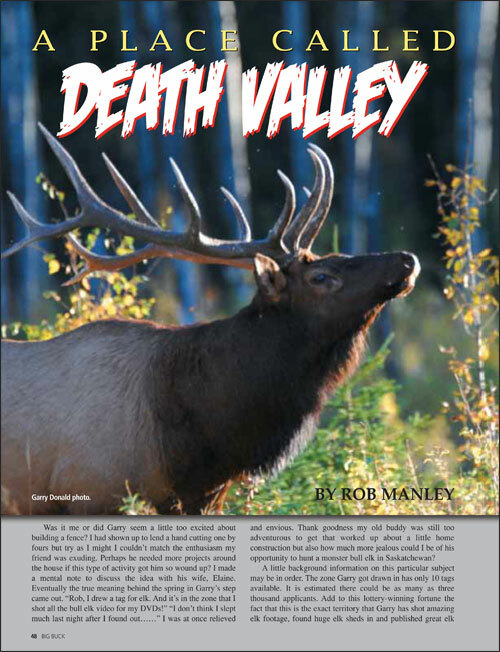 Darcy's mule deer also grew a tremendous amount of abnormal points that total 52 3/8 inches. The final score on this fine specimen is 233 4/8 non-typical points. My little partner and I had headed out for a late August drive one evening to see what kind of velvet-covered magic Mother Nature had once again weaved. 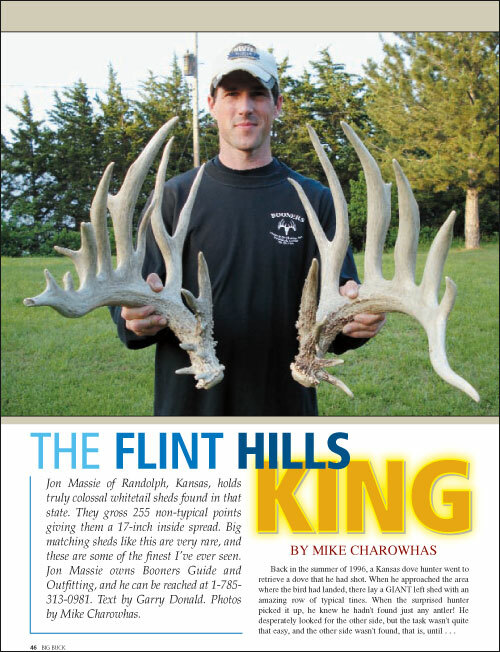 I started out for an area where my brother, Mike, had grazed a giant whitetail with a chunk of hot lead the previous fall. We had searched high and low for the buck and finally caught a glimpse of him late in the winter, looking no worse for wear. As we bounced down the old prairie trail, I smiled as my then seven-year-old boy gave me a vivid play-by-play of all that he saw even though I was watching it myself. 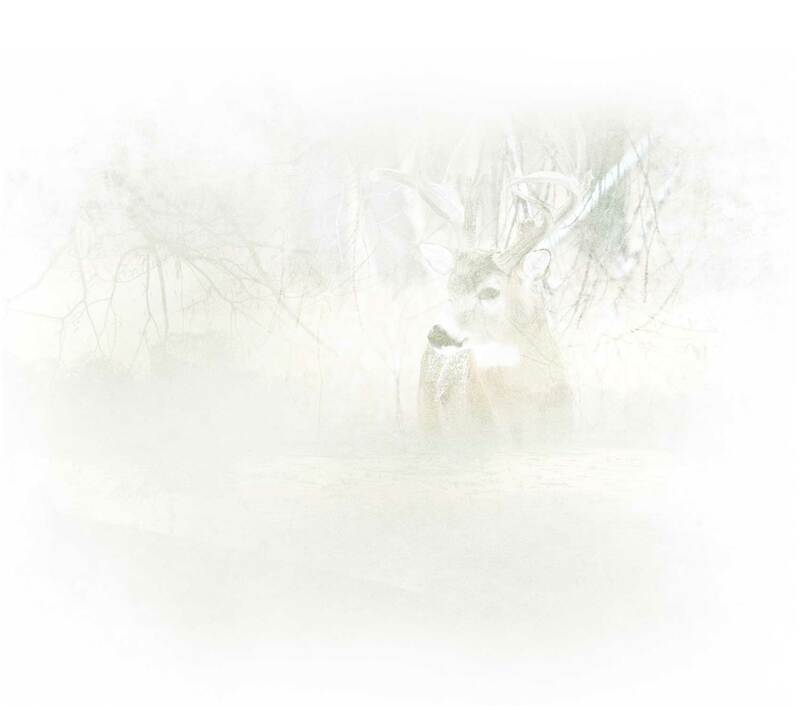 As the Heavy Chevy passed a bumper crop of standing wheat, an unseen deer suddenly stood up in his afternoon bed. The buck was a dandy 5x5 in full velvet..
That morning I had hiked in to the guts of the forest and quickly set up for elk. It was another great day to be alive as the scene in front of me was stunning. The fall colors were like a painting and even the birds were happy. My weapon of choice was my Sony video camera and soon I could hear bulls bugling in the distance. I was hunkered down in front of a big tree waiting and hoping they would come my way. Then more bugles erupted and they were much closer. At last I saw part of the herd with a big bull following a hot cow. My camera captured the moment as he put his head back and let out a call that made my hair stand up. 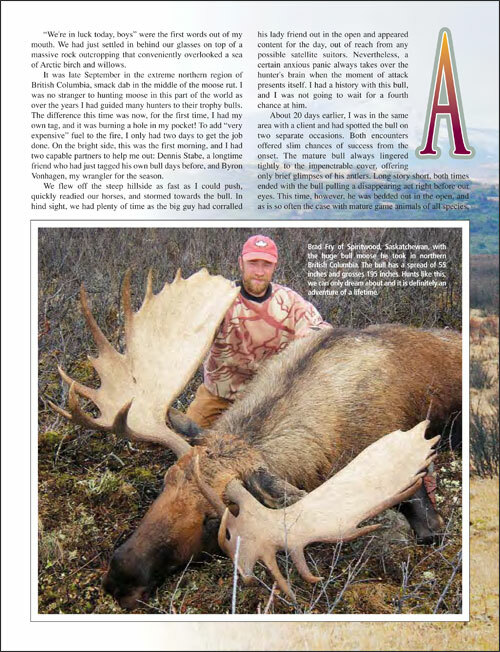 Chet Jans of Groundbirch, British Columbia, with the big whitetail he took in October of 2012. The 7x9 has an inside spread of 21 3/8 inches. Longest main beam is 25 inches even with brow-tines of 4 3/8 and 5 inches. All the G-2s and G-3s are well over 10 inches. The net typical score is 169 7/8 and adding the 19 2/8 abnormals that it grew the final score is 189 1/8 non-typical points. One thing I have learned hunting with my daughters is that they do not get as excited as guys, or maybe as excited as Dad. They are able to handle their emotions better and concentrate on the task at hand. A shot will not be hurried, and they will not shoot until they are confident with that shot. 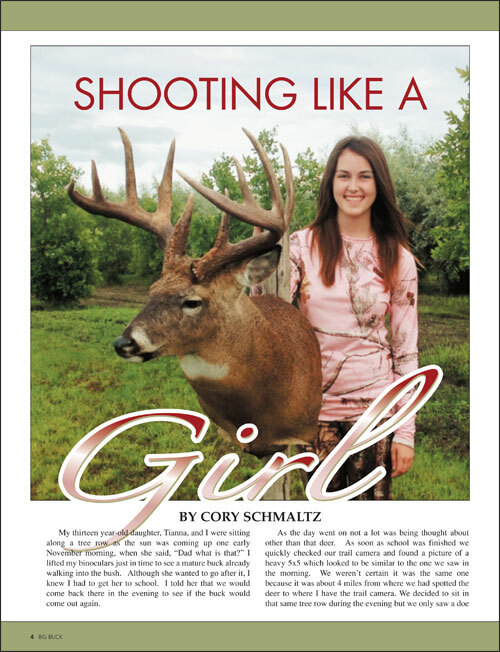 So if someone tells you that you shoot like a girl, take that as a compliment! 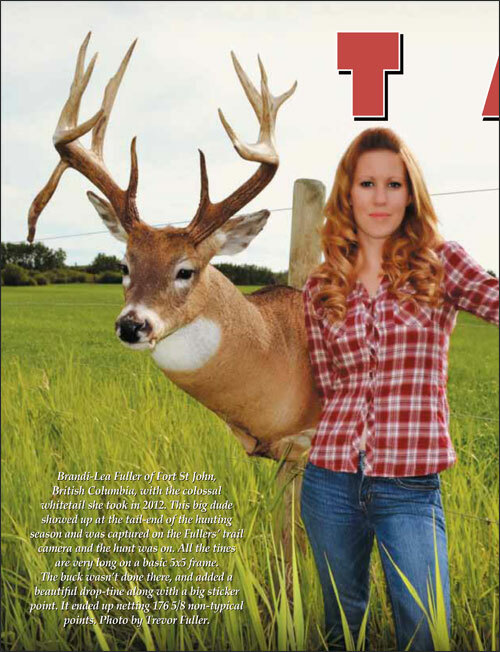 Brandi-Lea Fuller of Fort St John, British Columbia, with the colossal whitetail she took in 2012. This big dude showed up at the tail-end of the hunting season and was captured on the Fullers' trail camera and the hunt was on. All the tines are very long on a basic 5x5 frame. The buck wasn't done there, and added a beautiful drop-tine along with a big sticker point. It ended up netting 176 5/8 non-typical points. Photo by Trevor Fuller. Was it me or did Garry seem a little too excited about building a fence? I had shown up to lend a hand cutting one by fours but try as I might I couldn't match the enthusiasm my friend was exuding. Perhaps he needed more projects around the house if this type of activity got him so wound up? I made a mental note to discuss the idea with his wife, Elaine. Eventually the true meaning behind the spring in Garry's step came out. "Rob, I drew a tag for elk. 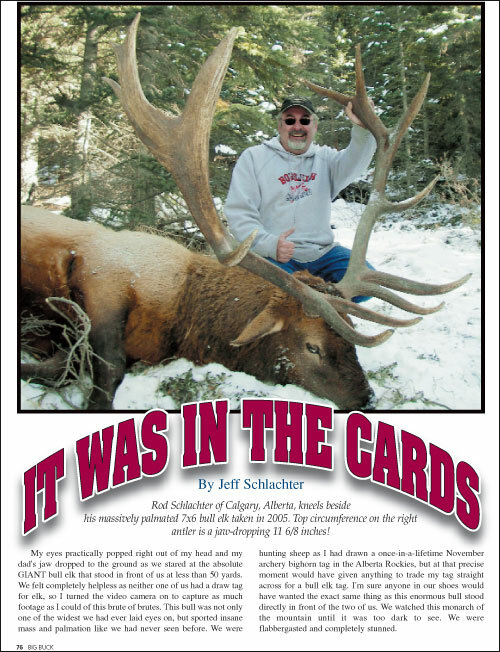 And it's in the zone that I shot all the bull elk video for my DVDs!" "I don't think I slept much last night after I found out......"
The hunting season started back in May when our family began to plan for our hunting season in fall. Deciding which draw tags to apply for and when I should book my holidays is always a major decision. The draw forms were filled out and we waited anxiously to see if one of us would be lucky enough to receive a tag or have to settle for hunting during the regular archery season. 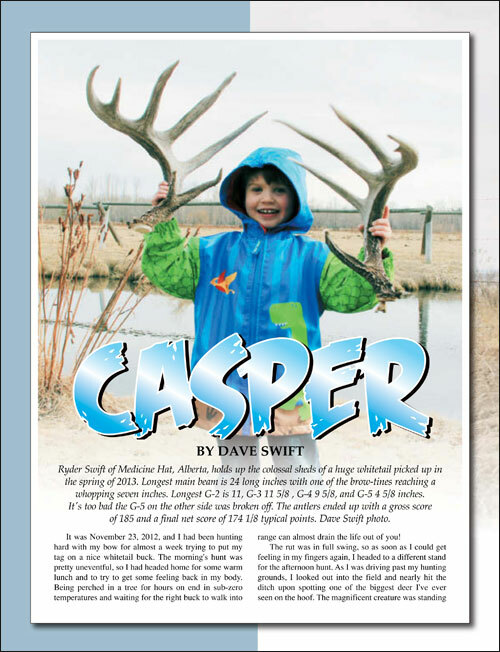 Ryder Swift of Medicine Hat, Alberta, holds up the colossal sheds of a huge whitetail picked up in the spring of 2013. Longest main beam is 24 long inches with one of the brow-tines reaching a whopping seven inches. Longest G-2 is 11, G-3 11 5/8 , G-4 9 5/8, and G-5 4 5/8 inches. It's too bad the G-5 on the other side was broken off. 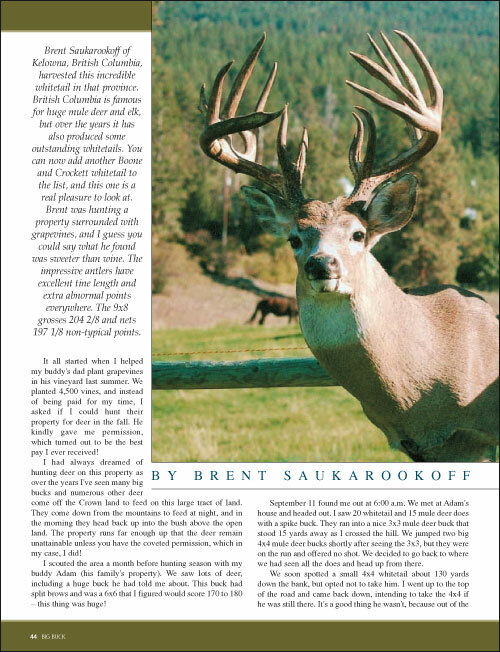 The antlers ended up with a gross score of 185 and a final net score of 174 1/8 typical points. Dave Swift photo. One of my favourite hunting partners and best friends is Donny Lloyd. He is my best buddy's 26-year-old son. I have been privileged to watch Donny grow up in our hometown of Cranbrook, British Columbia. 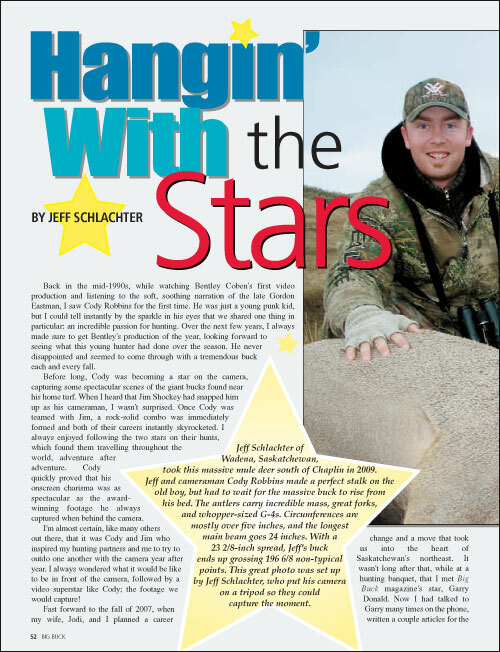 Over the years I have watched him excel at his two passions in life: hockey and hunting. have enjoyed watching him lead his peewee hockey team to victory and have seen him excel right through his WHL and AJHL careers. 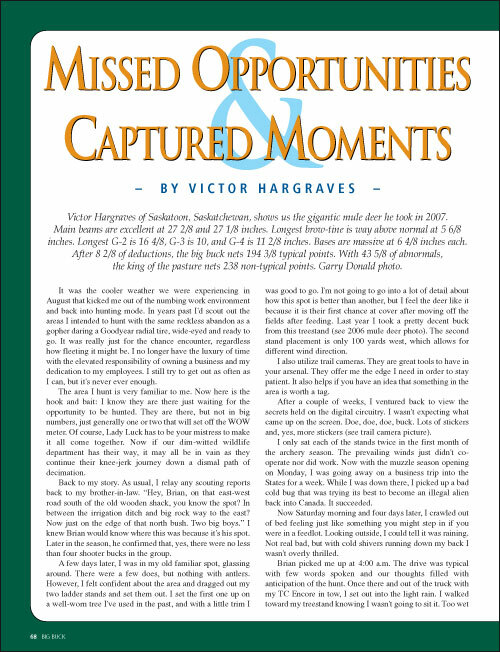 This story starts with the terrible corn crop disaster in southern Manitoba back in 1985. Hundreds of acres in the Pembina Valley had been rendered useless, but before the producers could collect their insurance money, the corn had to be destroyed. It didn't long before I realized that this was a terrible waste because it would provide great winter feed for our Manitoba whitetails. The winters are tough and this would sure help to pull them through. Cody Dyck of Pierceland, Saskatchewan, with the colossal black bear he took up in the northern part of that province in 2010. 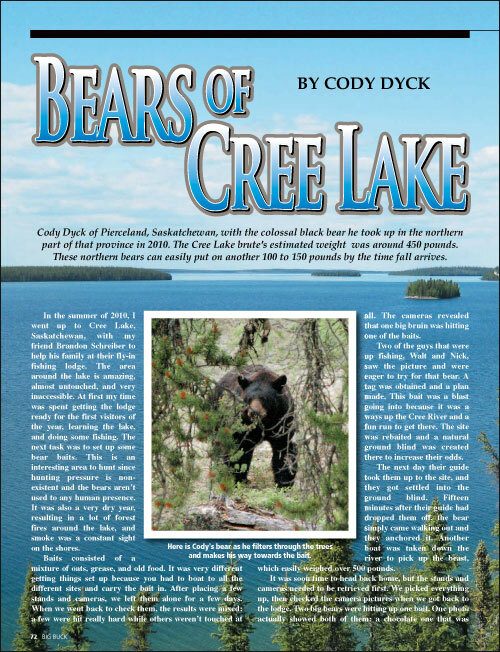 The Cree Lake brute's estimated weight was around 450 pounds. These northern bears can easily put on another 100 to 150 pounds by the time fall arrives. The days of November were quickly fading as I got ready for another day of whitetail hunting. That morning as Dad and I walked over to the truck, it was cold, but the skies were clear. 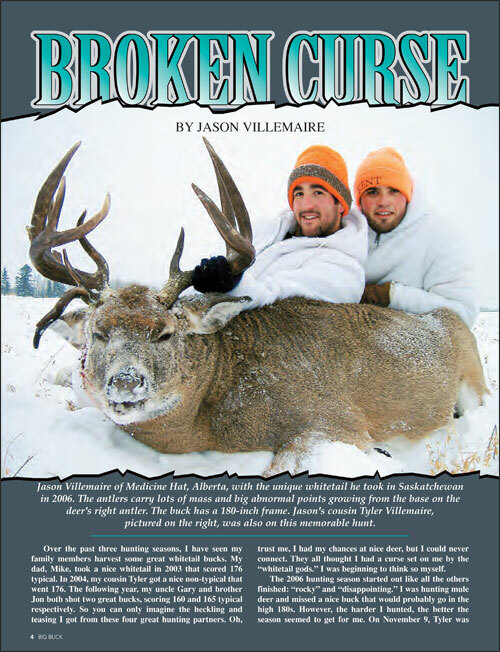 This was my first year of hunting for these elusive whitetails, and I hoped to get a chance. It was already November 27, and the 2011 season was sure going by fast. While hunting near St. Brieux the day before, we had seen a real nice 5x5 buck. He was standing right near an old road but soon started running the other way. 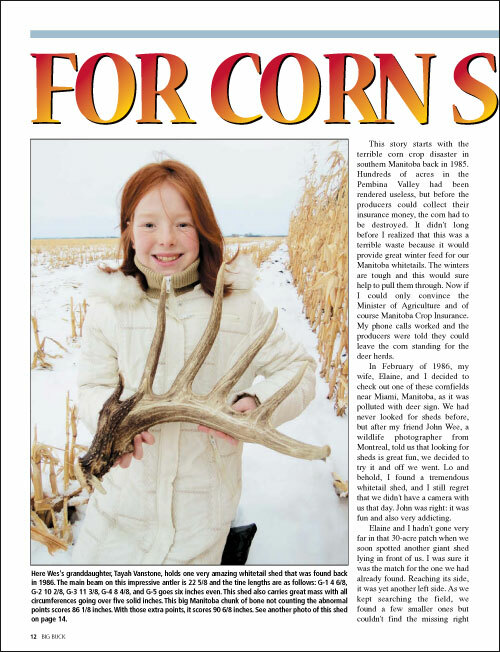 Ted Dooley and his granddaughter Kayla Dooley of Hartney, Manitoba, are all smiles after taking these impressive whitetail bucks in the 2010 rifle season. 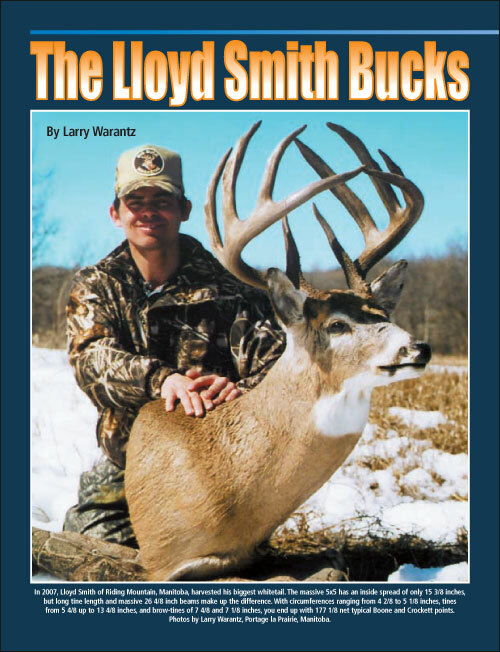 Ted's 7x6 buck grew long tines and big main beams and ranks high in the record book. Here are the numbers on this classy whitetail. Main beams are both over 25 inches with the longest brow-tine reaching 5 7/8. G-2s are both 10 6/8, and the longest G-3 is 12 5/8, G-4 goes 10 2/8, and G-5 is still good at 5 7/8 inches. Ted's buck grosses 193 7/8 and nets 186 6/8 typical points. Kayla was very happy for her grandfather, and then she ended up taking her first whitetail a few days later that nets 148 6/8 typical points. This was a wonderful experience for Ted and his granddaughter, and they will always remember this special moment. Taxidermy by Brad Minshull, Prairieland Taxidermy. Photo by Larry Warantz, Portage la Prairie, Manitoba. 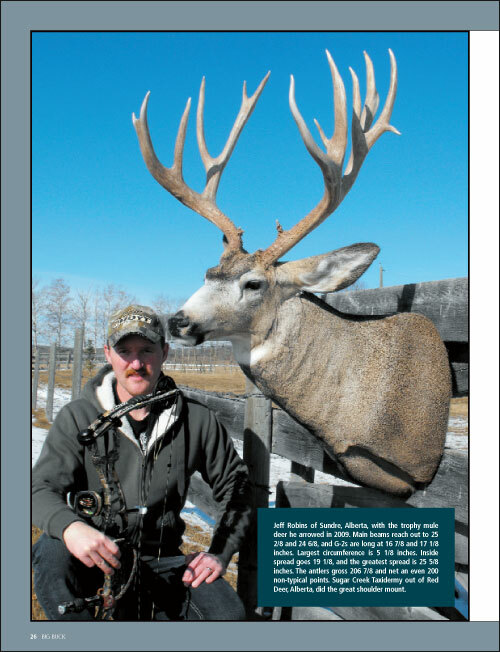 Ladon Cochrane of Birch Hills, Saskatchewan, with the truly magnificent mule deer he took on November 2, 2011. It ranks as the 10th largest non-typical ever taken in the province. 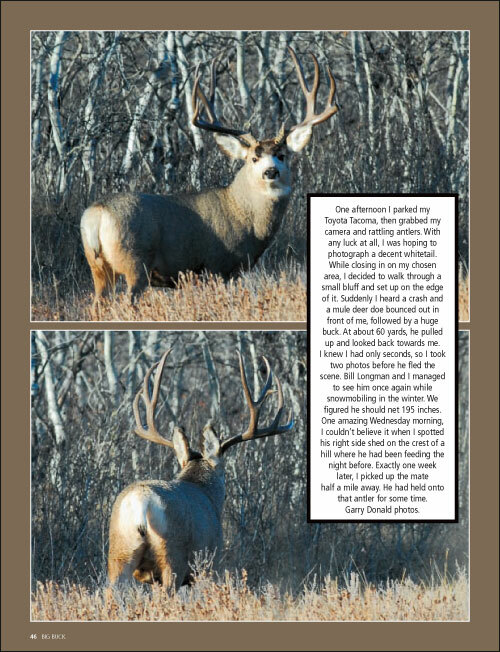 I photographed this monster at Graham Jensen's farm just after Landon took it, and I noticed it had broken off a huge abnormal point on the left antler. 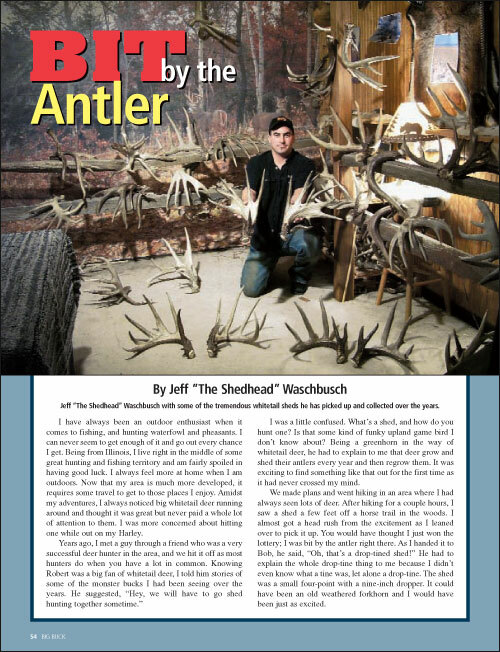 It would have been the match for the 12 6/8 abnormal on the right antler. 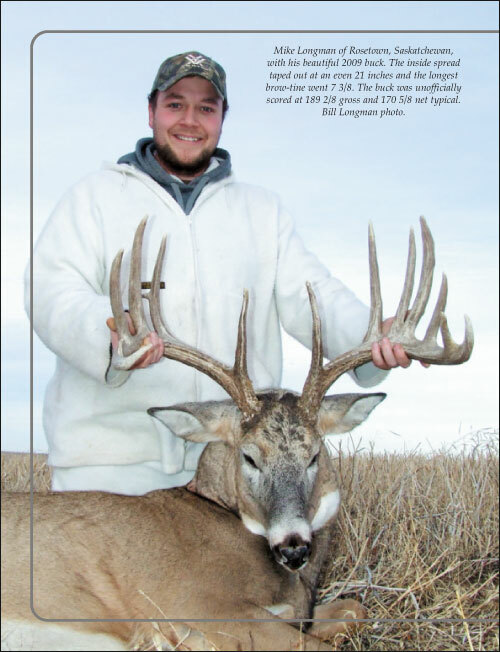 If it was the same length, the buck would have netted 280 inches, making it the fourth largest for the province. 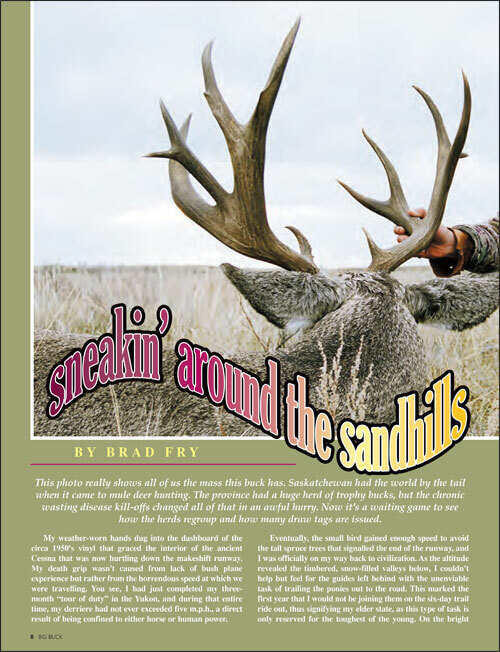 In Saskatchewan, only residents are allowed to hunt mule deer by a special draw tag. 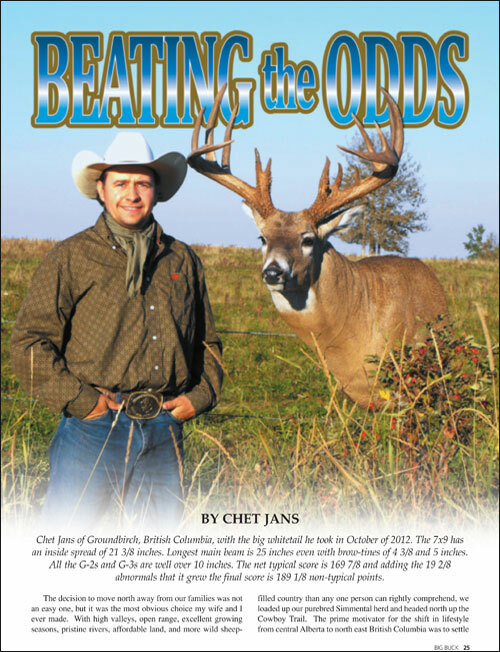 I believe that for this very reason Saskatchewan continues to produce some of the highest scoring mule deer taken in North America. 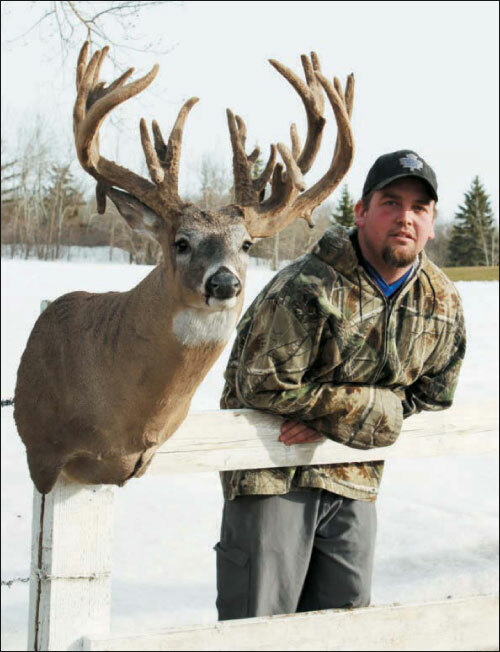 Dayne Majeau of Drayton Valley, Alberta, with the extraordinary whitetail he took in 2010. Main beams reach out to 25 2/8 and 24 6/8 with super brow-tines of 8 7/8 and 8 inches. 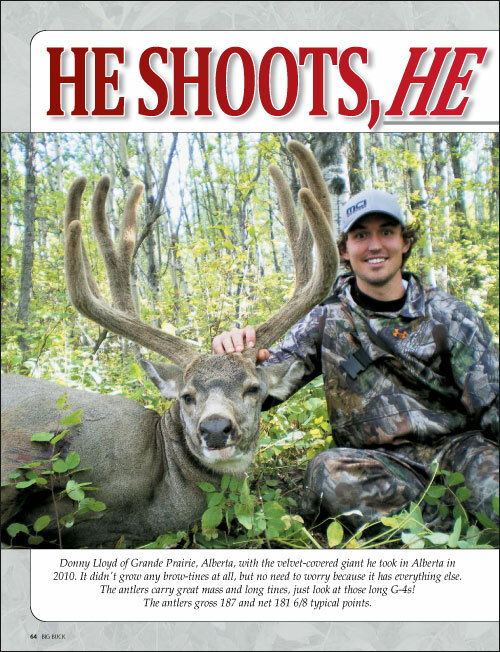 This Alberta buck has a great inside spread of 22 3/8 inches. The gross score is 204, and after many deductions it still nets 190 7/8 non-typical points. 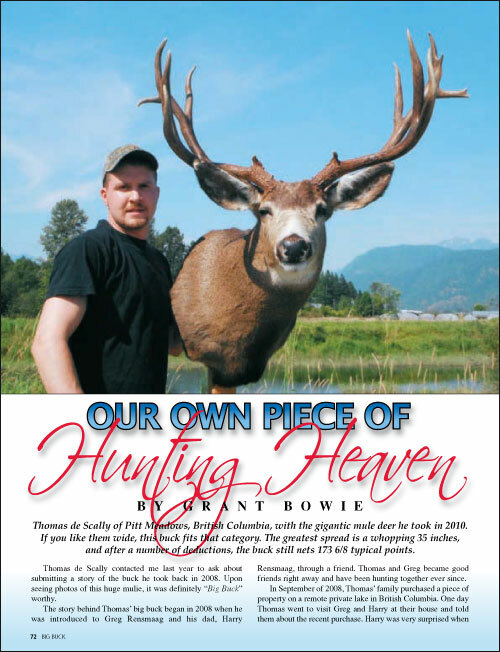 Thomas de Scally of Pitt Meadows, British Columbia, with the gigantic mule deer he took in 2010. If you like them wide, this buck fits that category. 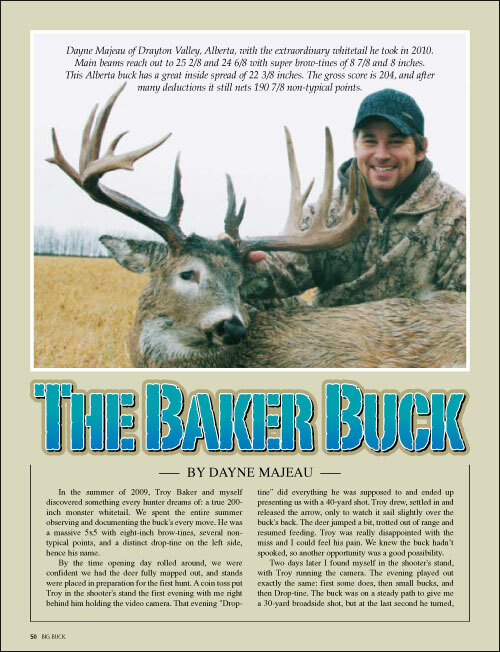 The greatest spread is a whopping 35 inches, and after a number of deductions, the buck still nets 173 6/8 typical points. 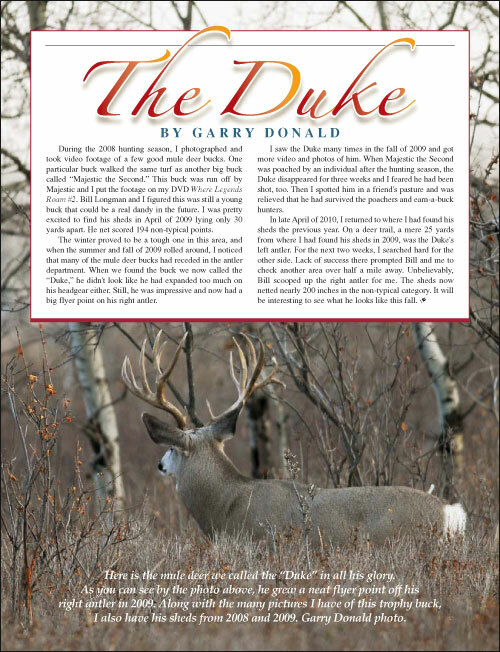 De Scally contacted me last year to ask about submitting a story of the buck he took back in 2008. 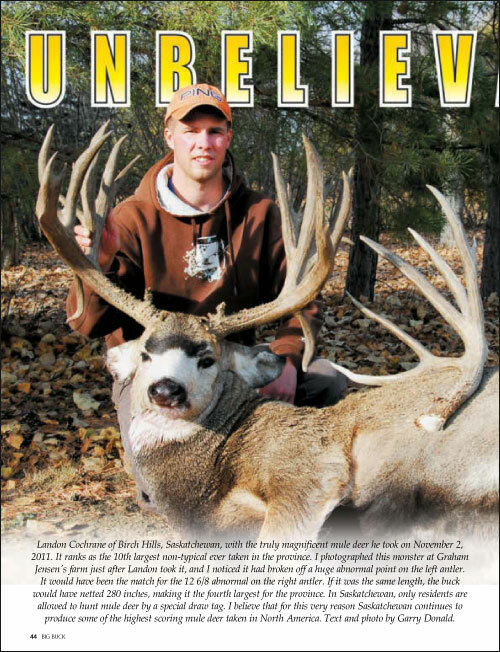 Upon seeing photos of this huge mulie, it was definitely "Big Buck" worthy. 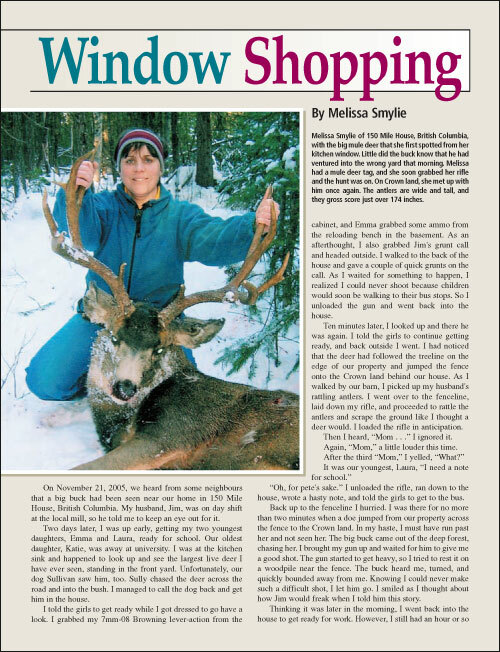 Susan Taylor of Saskatoon, Saskatchewan, stands beside the gigantic whitetail she took in that province in November of 2010. If you like seeing wide deer, then this buck is exactly that and more. 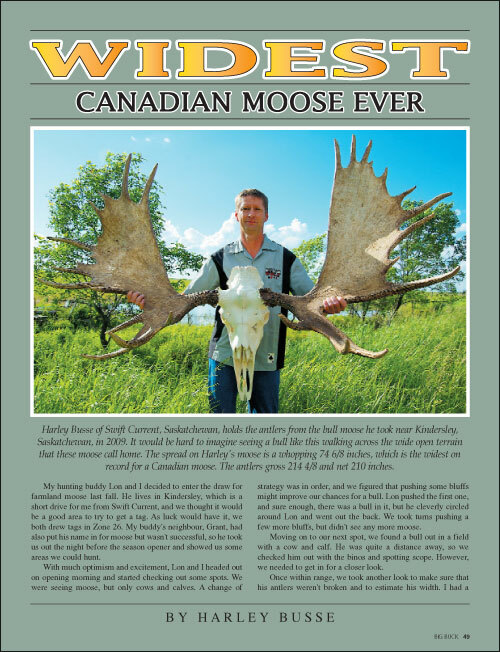 Greatest spread is a whopping 26 2/8, and the inside spread is still in the WOW category at 23 6/8 inches. Main beams are 25 and 22 3/8, with brow-tines of 4 5/8 and 5 3/8. The tines are shorter than most big trophy whitetails, but not to worry, it makes up for that real quick. G-2s, G-3s and G-4s are pretty well all over eight inches. 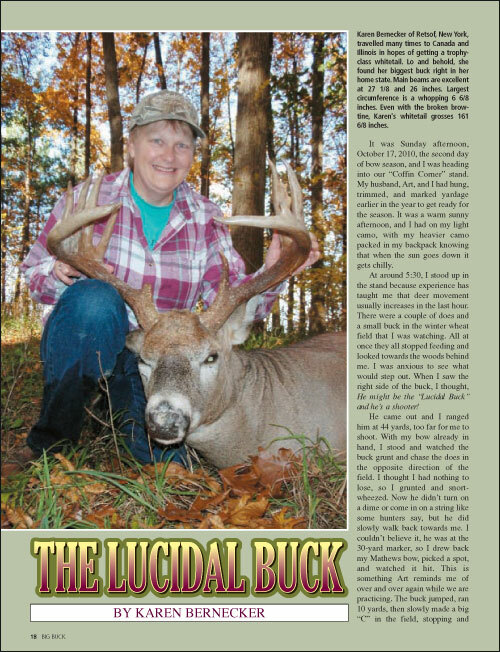 After 7 3/8 inches of side-to-side deductions, Susan's buck still nets 161 typical points. Now this gnarly 21-point whitetail also decided to grow a number of abnormals totalling 30 4/8 inches. Adding that to the typical portion, this wicked whitetail's final score is 191 4/8 non-typical points. All photos by Doug Hildebrand. 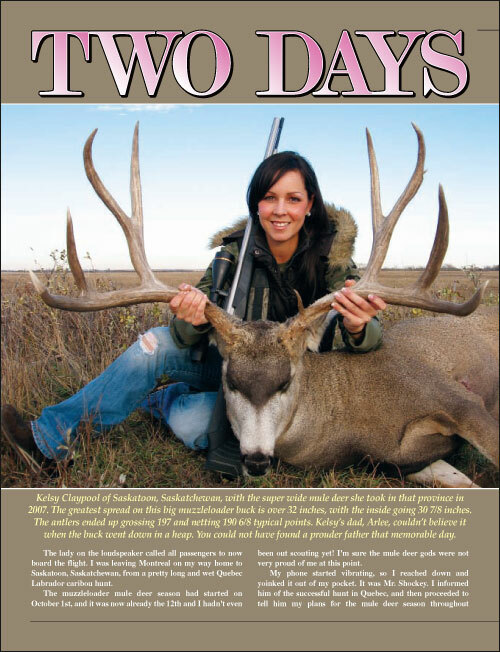 Alyssa Munton of Saskatoon, Saskatchewan, holds the big mule deer she took on November 11, 2011. 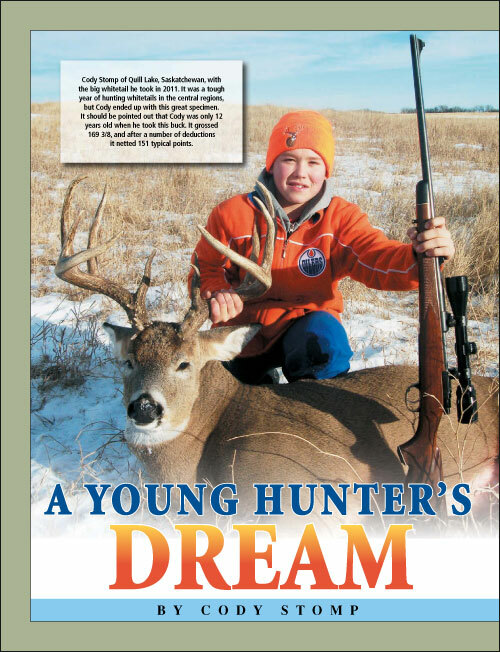 It was the young hunter's first deer, and what a way to start a hunting career! Main beams both reach out to 26 4/8 with the brow-tines going 2 4/8 and 3 7/8 inches. 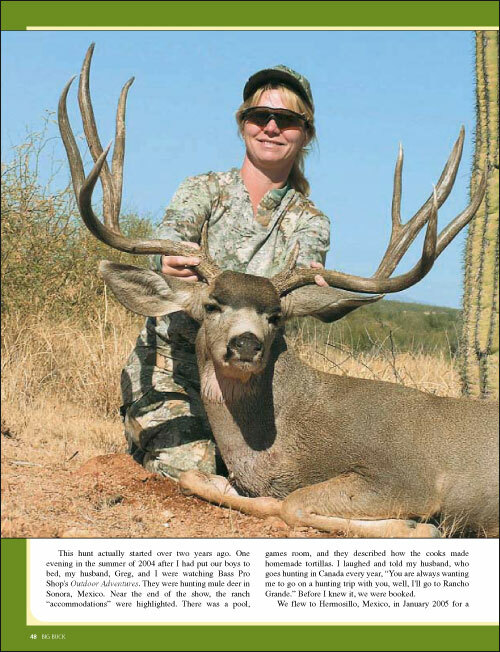 Alyssa's buck carries excellent tine length, and here are some of the longest measurements: G-2 16 5/8, G-3 12 7/8 , G-4 13 5/8. Circumferences average 4 3/8 inches. The antlers ended up grossing 192 7/8, and after 12 total inches of deductions, the final score is 180 7/8 typical points. Also pictured is a happy Cole Peterson of Saskatoon. Bryan Eberle of Spalding, Saskatchewan, will certainly remember that fateful November 20, 2010. 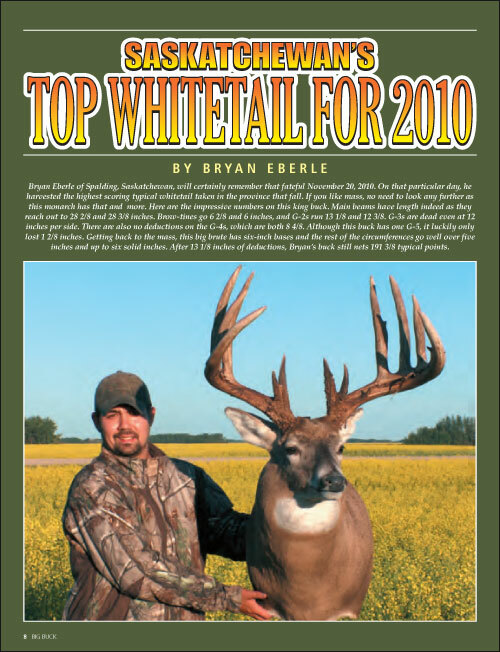 On that particular day, he harvested the highest scoring typical whitetail taken in the province that fall. If you like mass, no need to look any further as this monarch has that and more. Here are the impressive numbers on this king buck. Main beams have length indeed as they reach out to 28 2/8 and 28 3/8 inches. Brow-tines go 6 2/8 and 6 inches, and G-2s run 13 1/8 and 12 3/8. G-3s are dead even at 12 inches per side. There are also no deductions on the G-4s, which are both 8 4/8. Although this buck has one G-5, it luckily only lost 1 2/8 inches. Getting back to the mass, this big brute has six-inch bases and the rest of the circumferences go well over five inches and up to six solid inches. After 13 1/8 inches of deductions, Bryan's buck still nets 191 3/8 typical points. 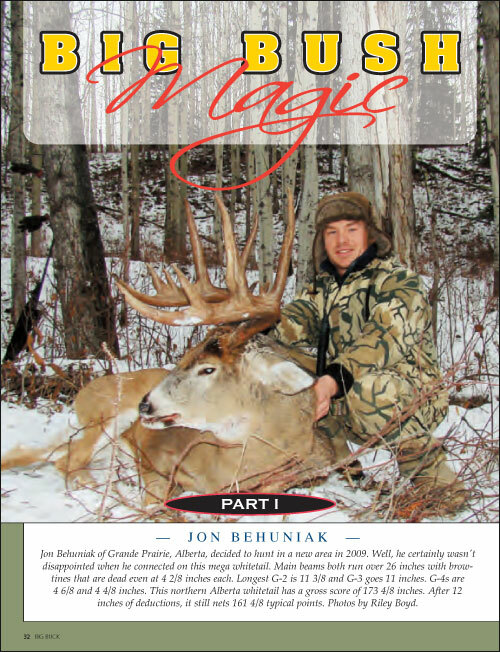 Jon Behuniak of Grande Prairie, Alberta, decided to hunt in a new area in 2009. Well, he certainly wasn't disappointed when he connected on this mega whitetail. Main beams both run over 26 inches with brow- tines that are dead even at 4 2/8 inches each. Longest G-2 is 11 3/8 and G-3 goes 11 inches. G-4s are4 6/8 and 4 4/8 inches. 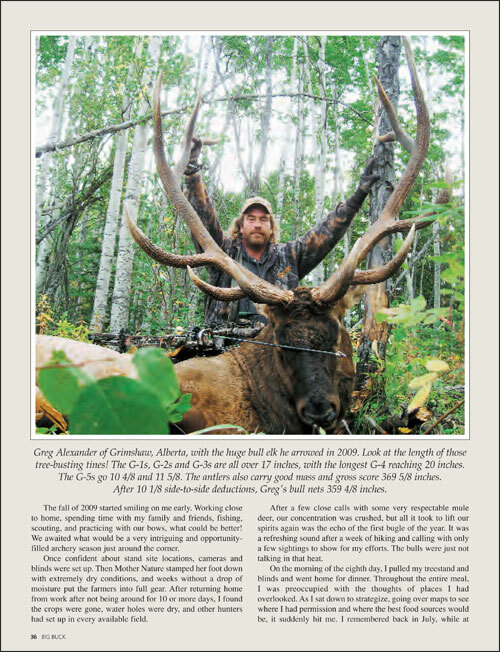 This northern Alberta whitetail has a gross score of 173 4/8 inches. After 12 inches of deductions, it still nets 161 4/8 typical points. Photos by Riley Boyd. They say good things come to those who wait. When the story involves Garry Donald and the act of pulling a trigger, you best add "and wait" to the age-old saying. 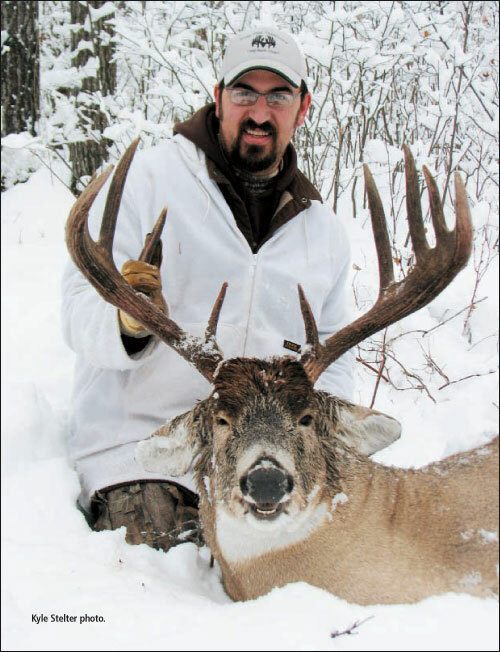 Photo: Garry Donald of Saskatoon, Saskatchewan, with his 4x4 whitetail that also grew two extra stickers. It was taken on November 30, 2009. Main beams are impressive at 26 inches, the longest tine is 13 inches, brow-tines go to 5 5/8, with circumferences at the bases at five inches. The antlers gross 157 and net 152 7/8 typical points. Bill Longman photo. It all started three years ago when I spotted this hog of a buck in early rut. I got a look at him running off into the bush after four does. 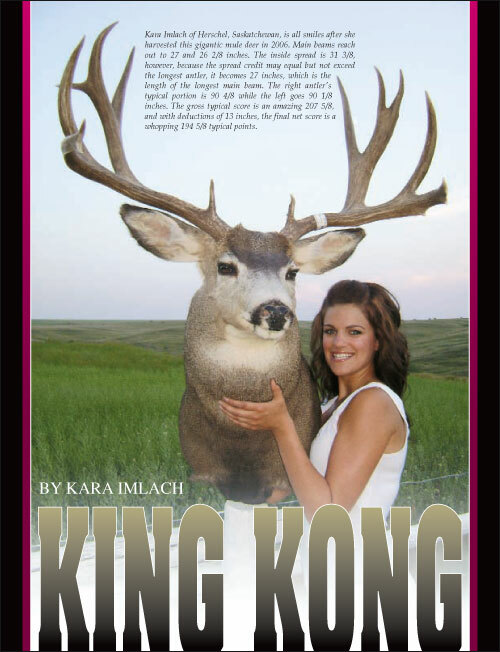 I knew it was going to be a big challenge to get a shot at this deer; he didn't get this big by being dumb. I hunted that area for the rest of the season, but didn't see him again. 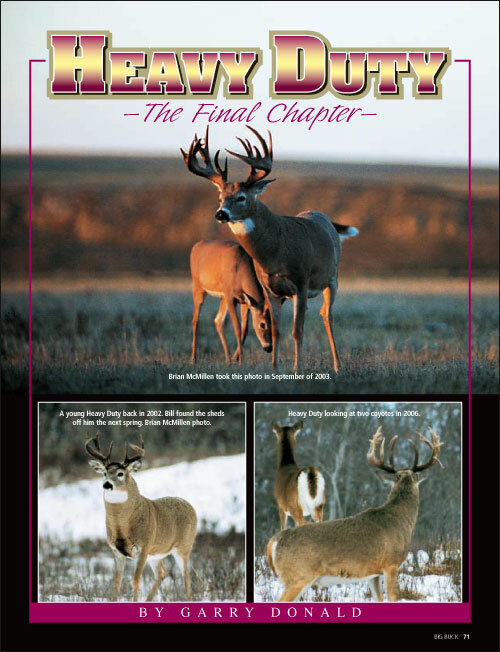 This pdf is a photo essay of the life of Heavy Duty. 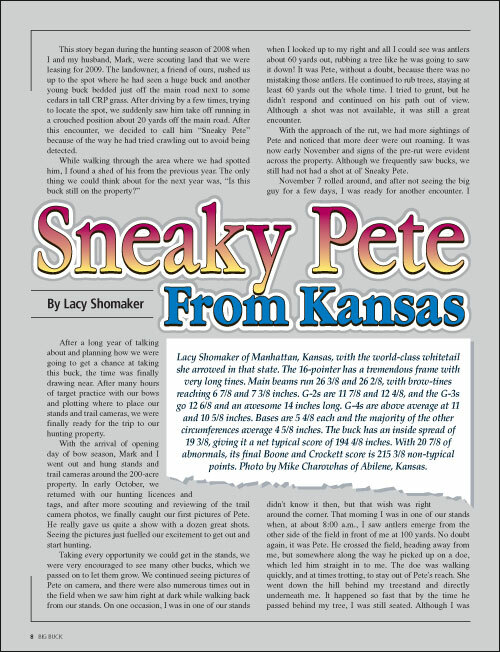 To read the rest of the story, check out the Spring 2009 editorial. 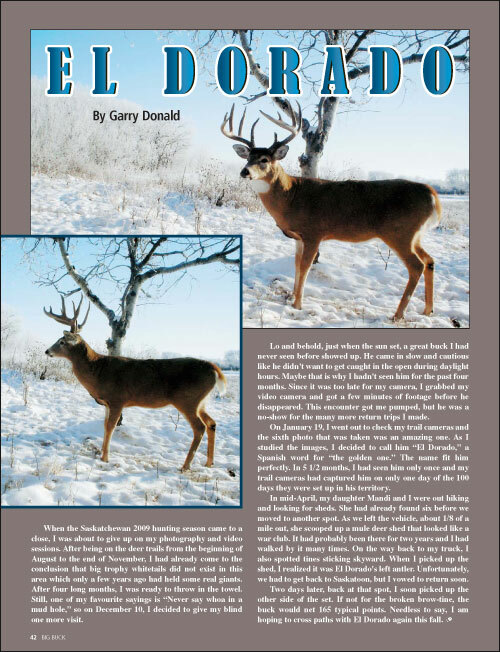 Page one shows photos of this big mule deer while page two shows the sheds that were picked up from the same buck. 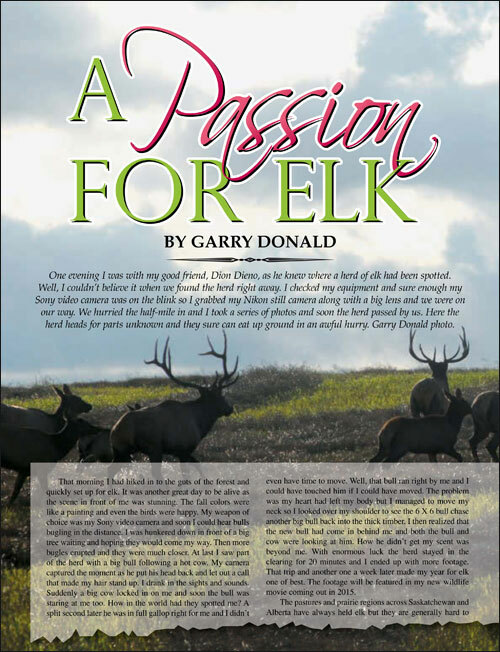 Garry Donald says, "One afternoon I parked my Toyota Tacoma, then grabbed my camera and rattling antlers. With any luck at all, I was hoping to photograph a decent whitetail. When closing in on my chosen area, I decided to walk through a small bluff and set up on the edge of it. Suddenly I heard a crash and a mule deer doe bounced out in front of me, followed by a huge buck. At about 60 yards, he pulled up and looked back towards me. I knew I had only seconds, so I took two photos before he fled the scene. Bill Longman and I managed to see him once again while snowmobiling in the winter. We figured he should net 195 inches. One amazing Wednesday morning, I couldn't believe it when I spotted his right side shed on the crest of a hill where he had been feeding the night before. Exactly one week later, I picked up the mate a half a mile away. He had held on to that antler for some time." As the morning sun slowly began to rise, casting a gorgeous pink hue onto the high peaks of the Alberta Rockies, my dad rode his horse up ahead on the first day of a week-long hunt. He stopped on a high mountain trail, and as I rode up beside him, he pointed down to a horseshoe lying on the ground. He said, "Well, Jeff, there's your horseshoe and it's pointing lucky side up." 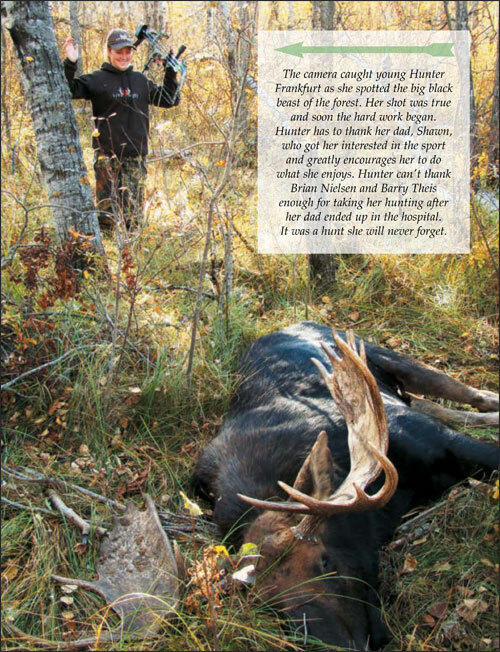 In 2007, Lloyd Smith of Riding Mountain, Manitoba, harvested his biggest whitetail. 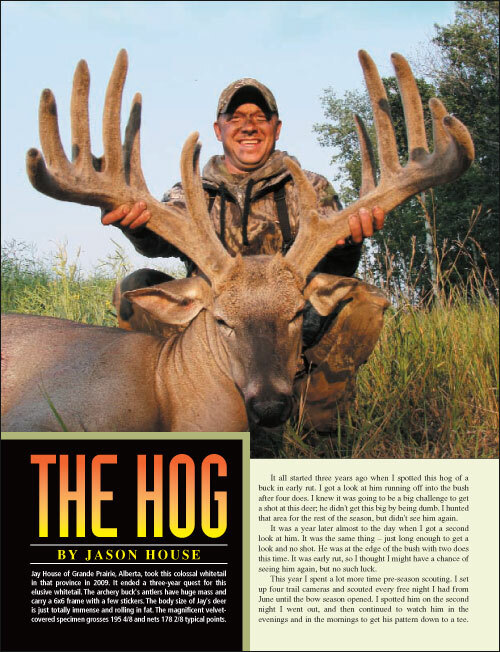 The massive 5x5 has an inside spread of only 15 3/8 inches, but long tine length and massive 26 4/8 inch beams make up the difference.With circumferences ranging from 4 2/8 to 5 1/8 inches, tines from 5 4/8 up to 13 4/8 inches, and brow-tines of 7 4/8 and 7 1/8 inches, you end up with 177 1/8 net typical Boone and Crockett points. Ever since I was nine years old, I have followed the hunting trails of my father with big hopes of seeing him get the big one. 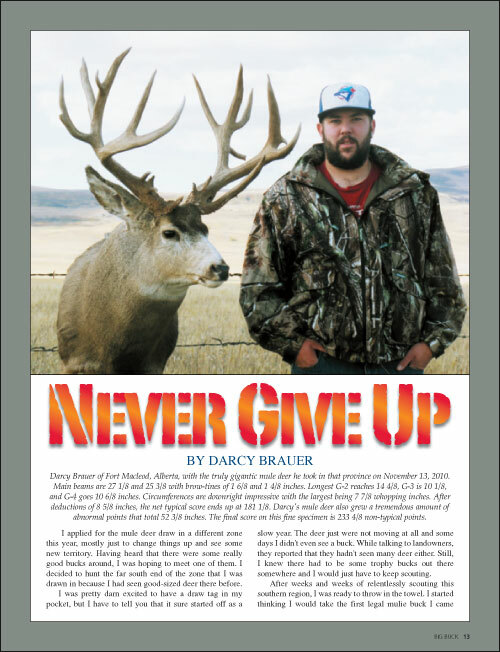 Eleven years later, he is still my very own personal guide and I now have a new understanding of the term "buck fever." It was September 2002 when it all started. Dad and I set out on our usual hunting trail one morning. We headed towards a nearby clover field, where we spotted a group of mule deer does feeding just outside the treeline. This hunt actually started over two years ago. One evening in the summer of 2004 after I had put our boys to bed, my husband, Greg, and I were watching Bass Pro Shop's Outdoor Adventures. They were hunting mule deer in Sonora, Mexico. Near the end of the show, the ranch "accommodations" were highlighted. There was a pool, games room, and they described how the cooks made homemade tortillas. I laughed and told my husband, who goes hunting in Canada every year, "You are always wanting me to go on a hunting trip with you, well, I'll go to Rancho Grande." Before I knew it, we were booked. 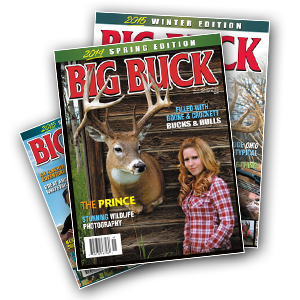 SUBSCRIBE TO BIG BUCK MAGAZINE TODAY!